Purchase the book on our online store. 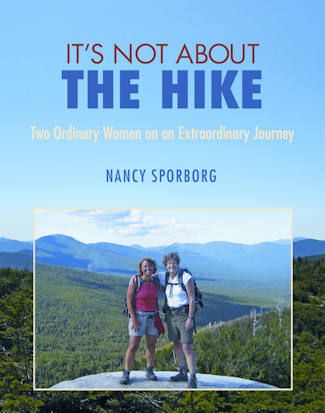 This is the motivational story of two ordinary women in the second half of their lives who start out walking the sidewalks of their hometown and end up climbing 190 mountains through all four seasons. Along the way they learn that it's not about the hike, it's about discovering who they are. It's about the beauty of nature, taking risks, finding childlike joy, connecting with others, pushing past comfort zones, overcoming fears, finding meaning and accomplishing something never thought possible. Through friendship and a journey that stretches 1,250 miles over five years, they learn that they can overcome anything one step at a time. This is not their journey, it's everyone's journey. And whether your mountain is a 4,000-footer in the White Mountains, or the sidewalk in your neighborhood, or raising children, losing weight, starting an exercise program or tackling a difficult project, you will find inspiration in these pages. This book lights a lantern and holds it up for people to find their way on their own journeys. And it kindles a fire in the belly of everyone who ever wanted to accomplish anything. This book will lift your spirits and inspire you to climb that next mountain in your life. After giving the It's Not About the Hike presentation 233 times over a five year period, Nancy and Pat have ended their gracewave run. Giving the presentation has been an incredible journey for us both. A video of our last presentation to a standing room only crowd in Keene, NH is available at our online store. Cost for the DVD is $25, including shipping.